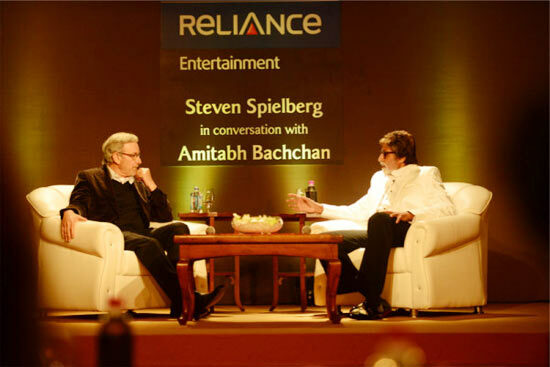 Award-winning filmmaker Steven Spileberg, who arrived in India on March 11, interacted with some of the brightest filmmakers from Bollywood in a session hosted by Anil and Tina Ambani and moderated by Amitabh Bachchan at Taj Land's End in Bandra, a western Mumbai suburb. The 90-minute invitation-only session, held in the ballroom of the five-star hotel was attended by 50-odd filmmakers from Bollywood while Spielberg's wife Kate Capshaw and DreamWorks' co-chair Stacey Snider were also present. Bachchan, who makes his Hollywood debut with Baz Luhrman's multistarrer The Great Gatsby this summer, kept the legendary filmmaker company as he fielded questions. 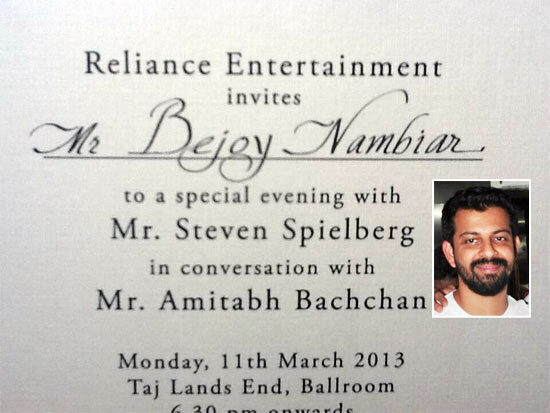 Spielberg's host in India, Anil Ambani will throw a star-studded bash for the director later this evening. 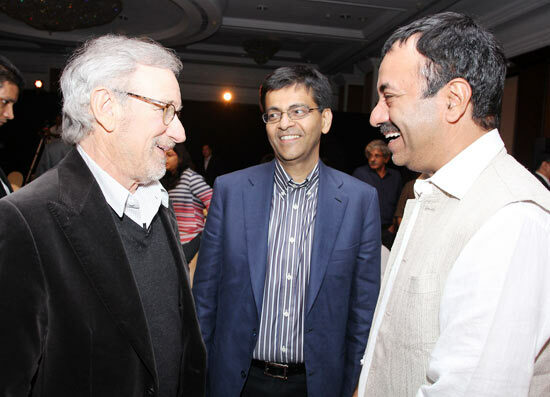 The Relaince ADA Group, headed by Ambani, signed a deal with Spielberg's Dreamworks Studios to produce films in 2008. So far, the collaboration has resulted in two acclaimed films -- The Adventures Of Tintin and Academy Award-winning Daniel Day-Lewis starrer Lincoln. Jaya Bachchan, dressed in white, played the perfect co-hostess as she mingled with guests and actively participated int he discussion. 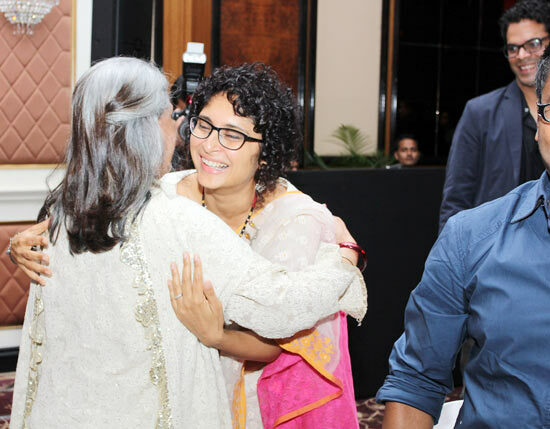 Bachchan greets Kiran Rao, one of the invited filmmakers. Along with new talent of the Hindi film industry, the veterans hold court at the discussion too. 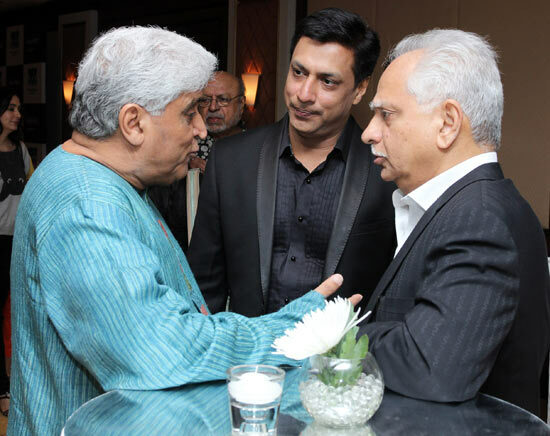 Noted lyricist and erstwhile screenplay writer Javed Akhtar was deep in conversation with Sholay director Ramesh Sippy and Madhur Bhandarkar. Bhandarkar excitedly posted a picture of him with Spielberg and tweeted, "it sure was a mesmerising & insightful master class with the master of the craft #StevenSpeilberg & @SrBachchan"
Director Rajkumar Hirani was delighted to have a one-on-one conversation with the noted filmmaker. Spielberg told the gathered crowd that he had liked Hirani's 3 Idiots, starring Aamir Khan, Sharman Joshi and R Madhavan. Directors Reema Kagti, Zoya Akhtar and Anurag Kashyap interact at the do. 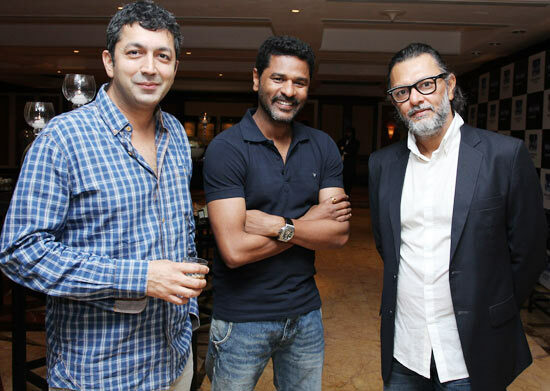 Filmmakers Kunal Kohli, Prabhu Deva and Rakeysh Omprakash Mehra pose for pictures during the session. 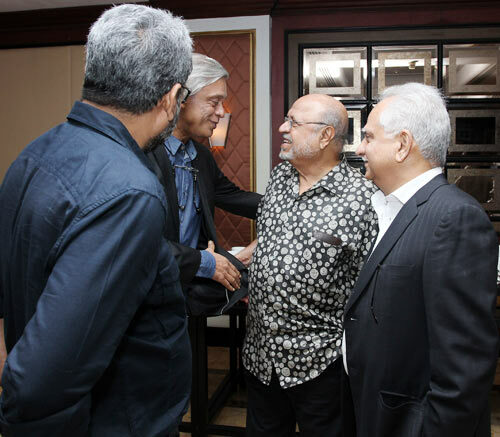 Sudhir Mishra and Shyam Benegal warmly greet each other as R Balki (in blue shirt) and Ramesh Sippy look on. Balki's wife Gauri Shinde who made her directorial debut with English Vinglish last year, was one of the five women directors invited to the do. 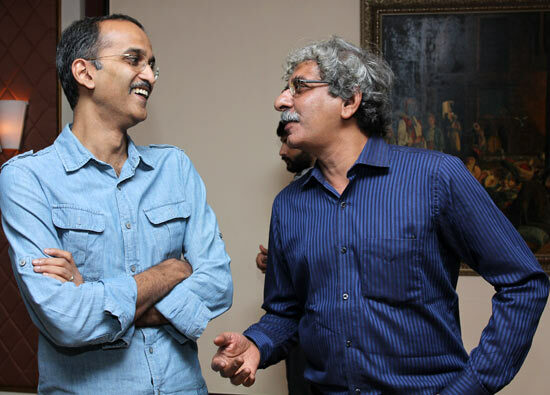 Nautanki Saala director Rohan Sippy caught up with Agent Vinod director Sriram Raghavan. 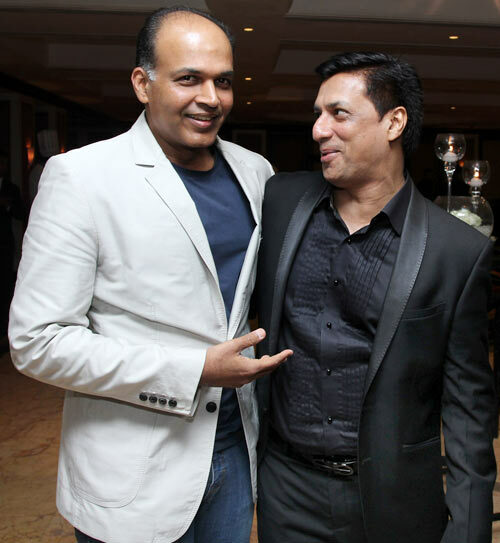 Director Ashutosh Gowarikar, who looked dapper in his white jacket, shares a light moment with Madhur Bhandarkar. 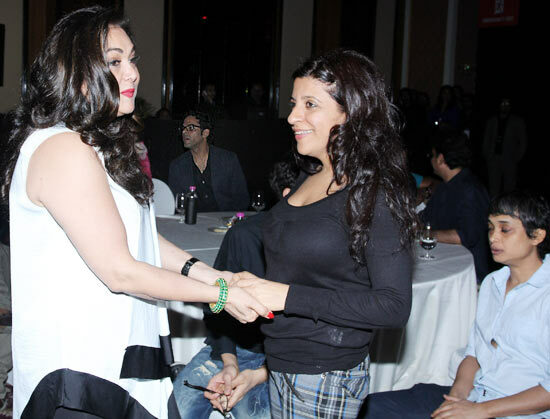 Hostess Tina Ambani, dressed in impeccable white, welcomes Zoya Akhtar. 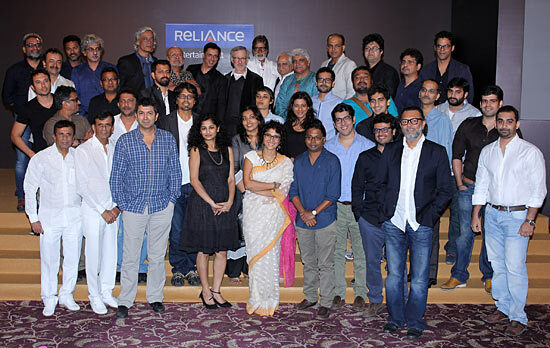 The guests posed with Spielberg at the end of the session. Abbas-Mustan, Homi Adajania, Bejoy Nambiar, Kunal Deshmukh, lyricist Prasoon Joshi, Rajshree Ojha (Aisha director), Rajkumar Gupta, Vikramaditya Motwane and Ayan Mukherjee were among the 40-odd guests at the do. David director Bejoy Nambiar tweeted a picture (above) of the invite and tweeted, "The day starts on a good note !" Spielberg revealed during the course of the session that he's planning a film based on Indo-Pak border. Bollywood's legendary obsession with cars! Farah Khan takes Om Shanti Om to Japan!